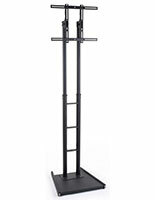 Buy Monitor Stand Sized for 65" LCD Monitor Wholesale! 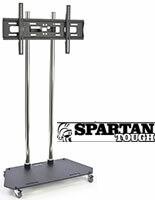 This Monitor Stand is Ready for Immediate Shipment! Buy Online Now! 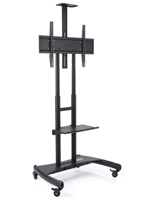 Mobile TV stand with shelf has lockable wheels to make transport of the unit simple. Heavy-duty steel construction provides durable display for trade shows. 37"-60" television of up to 176 lbs. can be displayed. VESA-compatible for 100mm x 100mm, 200mm x 100mm, 200mm x 200mm, 300mm x 300mm, 400mm x 200mm, 400mm x 400mm, 600mm x 400mm, 800mm x 200mm, & 800mm x 400mm. 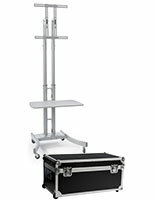 The portable monitor stand with height adjustable shelf, like a plasma television stand, has lockable wheels that allow fast and easy movement from one room to another. 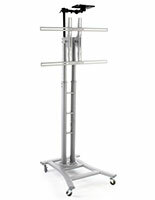 These wheels can be locked once the unit is in place, ensuring the television stand will stay where you want it. The LCD television stands use a tilt mount that angles the displayed television for the best view possible. 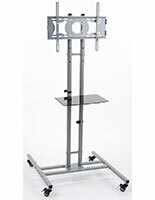 These floor mounts ship unassembled and include instructions and tools for fast set-up. The black and chrome finish of these mounts easily matches every setting. 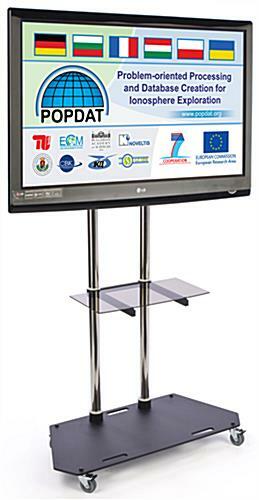 These flat screen monitor stands sized for 60" televisions or smaller and the easiest way to promote your products or services in any business environment. 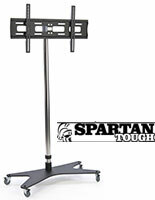 This flat screen mount, portable monitor stand with shelf holds a 37"-60" television and supports TVs that weigh as much as 176 lbs. The plasma mount is VESA compatible for 100mm x 100mm through 800mm x 400mm meaning it will support most television brands including Vizio and Panasonic. The portable monitor stand with shelf is constructed of durable steel with a black finish and is often seen at trade shows and conventions. The heavy-duty flat panel display includes the hardware needed for mounting most televisions to the bracket, though some may require different screws that may be purchased at any hardware store. 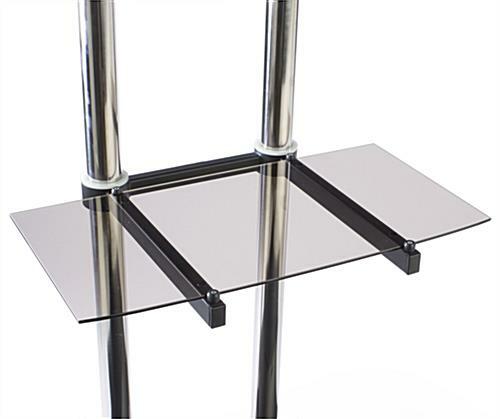 The glass shelf of this portable monitor stand is the ideal spot for electronic equipment such as DVD players and laptops, as well as brochures and sample merchandise. 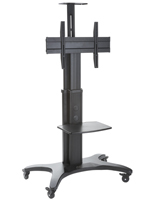 This quality monitor stand for 37"-60" flat panel teleivsions for sale online at wholesale prices is the last monitor stand you will ever want! 35.5" x 19.8" x 1.0"